This is behind the dash of a pilothouse boat that lives on a trailer. Last edited by starbright55; 03-12-2019 at 06:22 PM. Gotta get it up off the floor. Before doing that, going to have to clean it up and try spray paint to fight back the rust. After neutralizing the rust , application of a light coating of grease or at at least Corrosion Block will protect it. Same as on washdown pumps. The pump house is a Simrad design originating from the Robertson days. The pump house manufacturing and final assembly is still done at the previous Robertson factory in Norway. 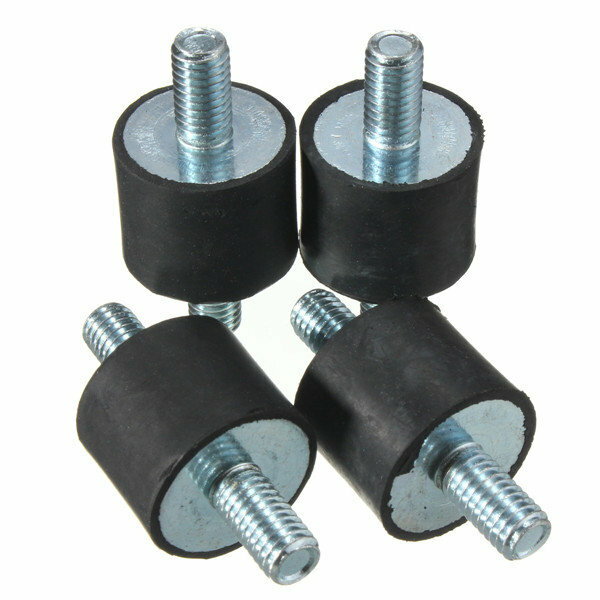 The motors have over the years been sourced from three different manufacturers, currently Parvalux motors are used. As previously stated get it up from the floor, I give the pump a spray of CRC 666 Marine a couple of times a year to avoid corrosion. I'm sure the dissimilar metals in the fasteners was not helping either. Should have rubber feet, (grommets) on the mounting plate too. Same as on a washdown pump. I'd put a spacer under it. Get some 1/2" or 3/4" Azek, (PVC lumber). I prefer to mount the pumps on a bulkhead, I mount a water resistant plywood plate to the bulkhead, I use some rubber door stoppers between the GRP and the plywood to reduce vibration transmission. The pump I mount to the plywood plate using vibration isolators. In this way I get the pump up from the floor and I avoid having vibrations from the pump causing structural vibrations (noise) in the boat. I've got some POR-15 I could brush on it and some thin plastic washers I can use to lift it a little and then use between the screws and the metal base. Unfortunately, I can't raise it too much - as it sits, I'm keeping a slight rise from the transom to the helm pump and any higher and I'd make the autopilot the high point in the hydraulic system. I just though it odd that a few month in a dry (but probably high humidity location since I live within a mile of the coast) that this thing is rusting already. By the look of the last picture I would say the rust originated from those screws. You can probably just wipe off the rust off that bracket and get some nylon washers to separate different metals. 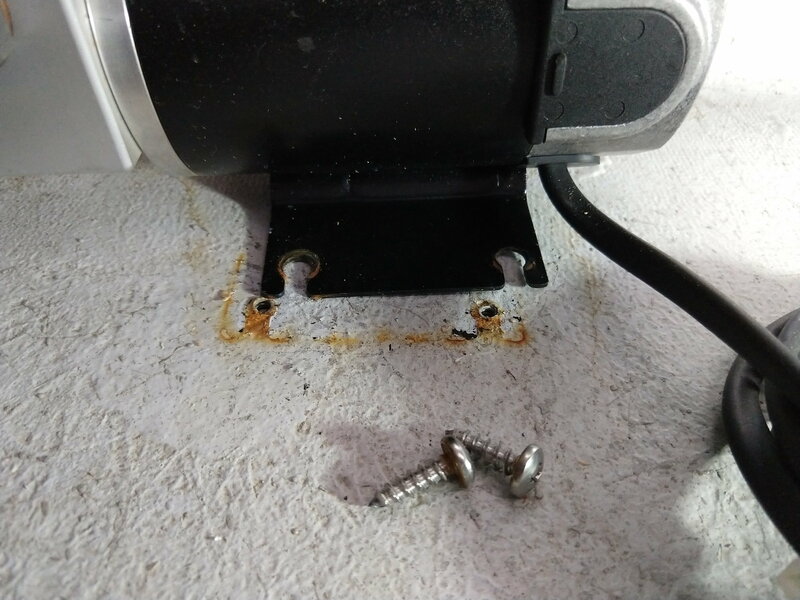 The edges of the plate the screws go through typically are bare and un-protected and will rust immediately in a salt water environment. Clearly, your pump is mounted in a wet or very damp location if it's rusting like that so quickly. 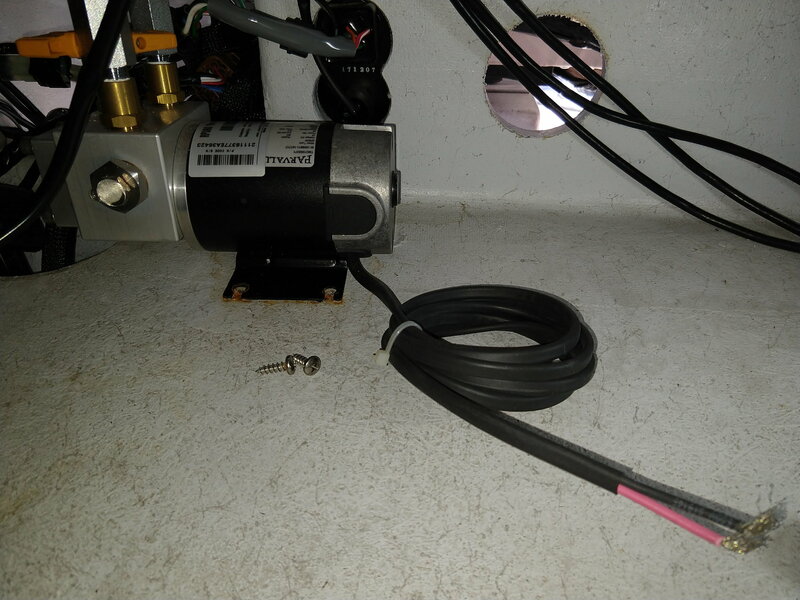 The pumps from the other manufactures have similar mounts made of steel and will also rust, so I wouldn't be so quick to blame simrad. 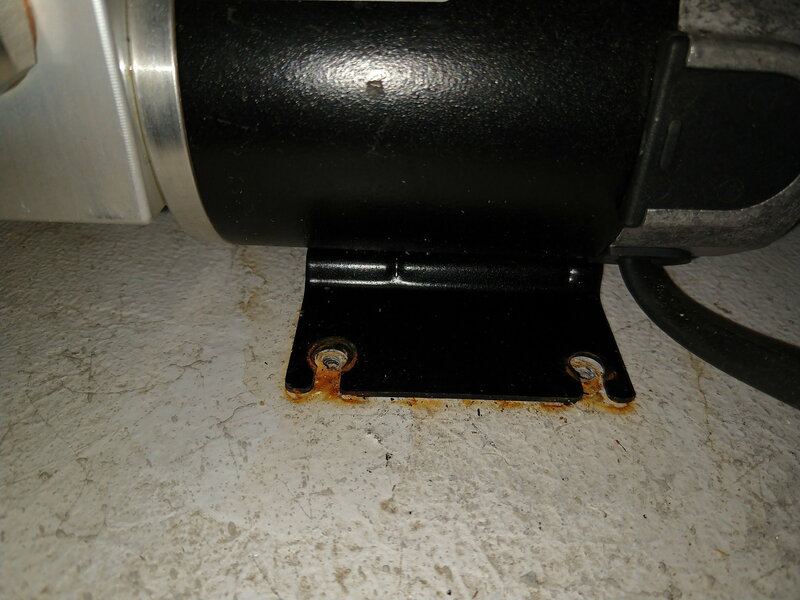 As others have said, either mount it on a bulkhead or at least elevate it above the wet floor using rubber or nylon washers, pvc, starboard, etc. Damp?? are you joking?? it's a boat, it's on the water, it's going to be damp!! It was on the water a few times at the end of summer (pump was installed late Aug). Since then, it's sat on the trailer - I'm just finishing up all of the house wiring right now. I agree, some water must have gotten in there to cause the rust but it's definitely not in a "damp location" - it's in an open backed pilothouse (with drop curtains that stay closed) and the dash is 6 ft. from the door. He lives in San Diego, so probably not accustomed to real humidity... Whenever I go to my boat in the morning, it's covered in water like it just rained... And it's inside! We don't have humidity but more than 50% of the time, my boat (and cars & trucks) are completely covered in water in the morning just from dew. The only rust I see is where the paint was scraped off by the screws, it doesn't take much to rust bare, mild steel. Clean it up, install the proper rubber isolators and spray it down (the entire unit) with Corrosion X. Putting each screw through a small piece (less than 1”) of 5/16” fuel line between the pump and floor make great isolators. BCTony and starbright55 like this. View Next Unread Grommet to Clean Up Installation? ?